I write to you after many lower-level contacts have failed to bear fruit, concerning the unacceptable decision by Lithuanian authorities to effectively destroy Vilnius’s oldest Jewish cemetery (dating to the 15th century), and even worse, humiliate in a racist spirit the many thousands of residents still buried there, by construction of a "Convention Centre" in the very middle of the old cemetery grounds. To add injury to insult, the plans are for this to be done with many millions of Euros from European Union structural funds. Rectification is remarkably easy in moving this project of Convention Centre to another venue where it can be celebrated by the Europe’s peoples. Regarding international laws, the right to rest in peace is a common principle for humanity, the UN Covenant on civil and political rights, article 18, the European Convention of Human Rights, article 8, 9, and 14, the particular importance of this principle for Jewish law in particular the sacred status of burial sites. Professor Louis-Léon Christians of the catholic University of Louvain in Belgium completed an excellent study regarding the preservation of Jewish cemeteries according to international laws. In 2014 the United States Congress passed a law in similar spirit protecting cemeteries of religious minorities internationally. During an earlier international scandal following the construction of two luxury buildings (2005-2009) on the edge of the site (the new convention centre is in its precise centre) the United States Congress reacted with a resolution in 2008, condemning the "failure to protect the historic Jewish cemetery in Vilnius." But that episode ended with the following "agreement": the offending buildings would stand but no more would ever be built. Today the Lithuanian authorities decided to disrespect their commitment of 2008 and will make an offence of a much greater scale (a Convention Centre in the heart of a cemetery). Moreover they directly involve European Union by utilization of structural funds to achieve the project. It is difficult not to make a link with the deeply rooted anti-Semitism in Lithuania. Many international Jewish organizations, and Jewish and Christian leaders alike, have protested robustly and the list grows by the day. We are verily facing a case of state hooliganism. The tiny official Jewish community is under pressure and cannot any more react properly having lost its de facto independence of thought. Instead of protesting, the community last week fired its own chief rabbi for having protested about the cemetery’s desecration by the projected EU-supported Convention Centre. Among those Vilnius residents who have protested in writing are the aforementioned Chief Rabbi, Rabbi Chaim Burshtein an elderly Holocaust survivor, a Christian pastor, an urban planner, and many more. This is the oldest and largest Jewish cemetery in Vilnius (historically Vilna, known for centuries as the “Jerusalem of Lithuania”); it was established in the 15th century and was in active use until closed by the Tsarist authorities in 1831. Known in Jewish and local city lore as Piramónt, the site is today in the Šnipiškės suburb, now in the Žirmūnai elderate, across the Neris River. In the 1945 to 1950 the Soviet authorities destroyed the above-ground portion of the cemetery by pillaging gravestones and using them as building materials for ballast and walls. The Soviets built the Žalgiris Stadium. The Palace of Concerts and Sports was built in 1971 right in the middle of the cemetery. In early 2015, however, it began to emerge that there were plans to build a 22.8 million Euros Convention Centre in the middle of the cemetery, near the derelict Sports Palace. The prime minister indicated that this could be followed by parking lots and a hotel. Alarm bells were raised in April 2015 when a group of London rabbis (known from a Wikileaks-divulged US State Department cable from 2009 to have then sought payment for supervision work of digging on the site, in violation of the opinions of all other rabbis internationally), were shown on television to be received by the prime minister himself. A week later detailed plans were published concerning the breakdown of the budget, with thirteen million Euros slated to come from the European Union’s structural funds grants. Since then, there has been a renewed outpouring of opposition from Jewish and Christian leaders in Vilnius, and from around the world, concerning the desecration of the cemetery by a Convention Centre where thousands will cheer, clap and use bars and others over and surrounded by thousands of graves of Vilnius residents who had duly paid (or whose families paid) for their plots as purchases in perpetuity over half a millennium. It has been accepted that such plans would never be made for a historic Christian or ethnic Lithuanian cemetery; this is pure ethnic and religious discrimination. However, the agreement of the London group of rabbis and the chairwoman of the Jewish community has been used to legitimize it, and this began to look very clear in August 2015 when she fired the Chief Rabbi for daring to disagree with her about the cemetery. It is unthinkable that the European Commission would invest millions of Euros in the humiliation of thousands of graves of Jewish residents of Vilnius who have no descendants or relatives to fight for their rights precisely because of the Holocaust. We call on the European Commission to indicate promptly and firmly to the Lithuanian authorities that the Convention Centre must be moved to another site where it can be a source of pride and not of shame. 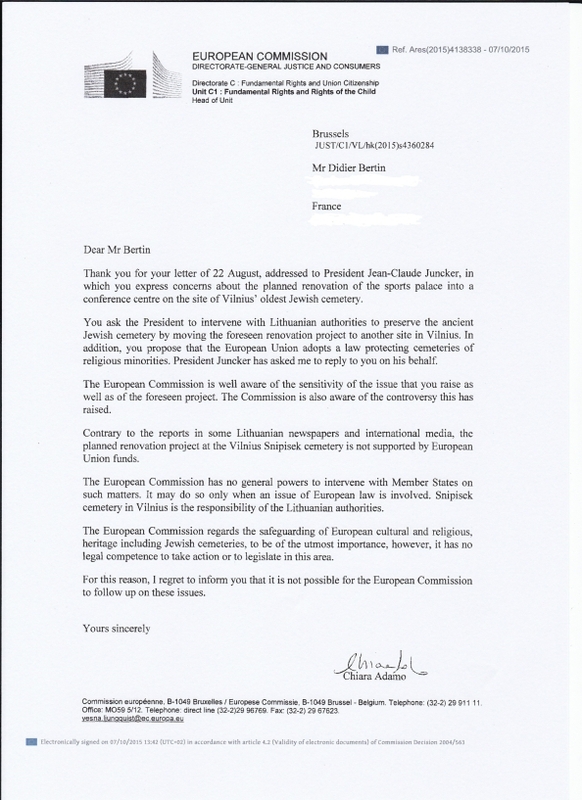 Contrary to the information propagated by the Lithuanian Medias, the European commission denies any participation in financing the construction of buildings on the Jewish cemetery in Vilnius. However, and although the desecration of cemeteries are prohibited by international and European rules, the European Commission declares itself incompetent to prevent the Lithuanian government to engage in such a desecration. The European Union once again appears as a simple association soulless and without ethics concentrated on financial and economic problems for which it has effectively a power over the Member States.